The next step is to find the best equation for Eq. (11.31) (see Chapters 6 and 10). The construction of such models will be demonstrated in the next Sections 11.3.2 and 11.3.3, starting with a relative simple model consisting of only three balances and ending with the activated sludge model (ASM) 1 with 13 balances. Further models will be mentioned briefly in Section 13.3.5. • Monod kinetics (considering S and c' as substrates). • Bacteria concentration is measured as g L-1 COD. yield coefficients: in the substrate balance YX/S, in the oxygen balance YX/O2 and the factor 1 in the bacterial balance. Table 11.1 Simple model matrix for an activated sludge reactor, only carbon removal, see Eqs. (11.34) to (11.36). and — as the dimensionless oxygen saturation concentration. For high Sm numbers, there is only a very low concentration gradient of dissolved O2 near the bubble surface and the reaction is controlled by growth kinetics of bacteria; for low Sm numbers, c' is very low (c*-c'~ c*) and the reaction is controlled by the mass transfer rate. In a similar manner, the balances of substrate in Eq. (11.34) and bacteria in Eq. (11.35) can be written in dimensionless form (see Section 6.2), with Da = pmaxtR as the Damkohler number, nR = QR/Q0 as the recirculation of sludge, nE=XD/Xa as the thickening ratio and Mo = S0/KS as the Monod number (Mehring, 1979). for Mo = 10 (KS = 50 mg L-1 COD, S0 = 500 mg L-1 COD). The other constant parameters are given in Figure 11.1. For Da < 0.2 (S*=Mo=10), the mean retention time is low and all bacteria are washed out, even though the substrate concentration is high. Due to the low oxygen consumption rate (low tR), no influence of Sm (or kLa) can be observed for 0.2 < Da < 0.25. For Da > 2.5, the oxygen consumption rate is again very low because of the very low substrate concentration. Only in the middle region (0.25 < Da < 2.5) can a large influence of Sm (or kLa) be observed. For Sm > 100, carbon removal and bacterial growth are not dependent on aeration intensity. For Sm = 25 and a substrate removal of 90% (S* = 1 for S* = Mo = 10), a Da = 0.5 is needed if an aeration system is to be used effectively (Fig. 11.1). The reaction is limited by dissolved oxygen. Using pure oxygen (c*/K' = 475), the mean retention time tR can be reduced by about a factor of 2 and oxygen limitation is avoided nearly completely (Fig. 11.2). Fig. 11.1 Influence of dimensionless mean retention time Da = |maxtR and dimensionless specific mass transfer rate Sm = kLa/|max on dimensionless effluent substrate concentration S/K S. Constant parameters: Mo = S0/K2 = 10, nR = 0.45, nE = 3, c*/K' = 95 (aeration). Fig. 11.2 Influence of dimensionless mean retention time Da = |maxtR and dimensionless saturation concentration c*/K' = 95 (air) and 475 (pure oxygen) on dimensionless effluent substrate concentration S/KS. Constant parameters: Mo = S0/KS = 10, nR = 0.45, nE = 3, Sm = 25. 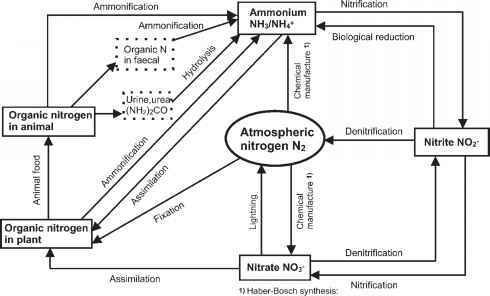 This model describes the relatively complex process of aerobic and anoxic C and N removal from municipal wastewater. It is based on the post-doctoral work of Gujer (1985) and the work of Henze et al. (1987a, b). In order to present the model in its fundamental form, it is shown as a matrix which contains only reaction terms as sources (positive) or sinks (negative). This matrix is normally published without further explanations or is explained only briefly (Grady et al. 1999; Henze et al. 2000). In this section, we try to give an introduction to provide a better understanding. • Primary models describing different kinds of reactor configurations (anoxic/aerobic; aerobic/anoxic). • Models describing different kinds of reactors (CSTR in one stage or as a cascade, plug flow or flow with axial dispersion, see Chapter 6). The very simple matrix in Table 11.1 consists of only three different substances (bacteria, substrate and oxygen) and only one process (aerobic growth of hetero-trophs and removal of organic substrates). ASM 1 consists of 13 different substances and eight different processes. At the beginning, we will give an overview of these 13 substances (Table 11.2). Table 11.2 The 13 substance concentrations of ASM 1. Units for symbols 1-7: mol L-1 COD; units for symbol 8: -mol L-1 COD; units for symbols 9-12: mol L-1 N; units for symbol 13: mol L-1. It should be emphasized that, besides the readily biodegradable substances SS, slowly biodegradable substances XS are considered as solid particles, which must first be hydrolyzed by exoenzymes. Xj is the corresponding inert organic matter which cannot be disregarded, as we will see below. Particulate products XP result from the lysis of bacteria or remain as insoluble solids. The eight processes are summarized in Table 11.3. The matrix of the ASM 1 model consists, therefore, of a 13 x 8 matrix for the 13 substances in the columns and eight processes in the rows. eight for different dissolved components (7 S + c') and five for different undissolved components X. Only the reaction terms rSi are arranged in the matrix. The reaction terms should be discussed in some detail before the matrix is constructed (see Table 11.4). We will begin with the reaction terms for soluble inert organic matter. Table 11.3 The eight processes of ASM 1. This assumption is a simplification made by ASM 1. In reality, such dissolved inert substances (non-biodegradable) can be formed by the hydrolysis or lysis of solid particles or other dissolved substances or they can be adsorbed on solid surfaces. rSS is the rate of COD removal by aerobic and anoxic bacteria. and SS can only be determined if Si is known. n is the ratio of pmax,H values for anoxic and aerobic bacteria (Henze 1986). reflects oxygen consumption (or COD removal) by aerobic heterotrophs and auto-trophs. Therefore, the units of rO2 are g m-3 h-1 COD. Finally, Eqs. (11.61) and (11.65) are introduced into the matrix of Table 11.4 (space i = 8 for j = 1, j = 3). As already assumed for nitrifier growth (i = 6), where nearly no NO2 is produced, denitrification goes directly to nitrogen and the denitrification of NO2 is not considered (Chapter 10). YO2/NH4_N,x = 4.57 g O2 (g NH4_N)_1 follows from Eq. (11.64). particulate organic matter fP see Eq. (11.58). describes the change of pH. For SAlkP SAlk0 the pH increases and vice versa. The pH influences some equilibria (NH+/NH3, NO-/HNO3) and the activity of bacteria. In wastewater with a low SAlk0 and nitrification, rAlk cannot be neglected. The balance of anions is written in moles. 12 HCO- are needed for 6NH+, these are 6 more moles anions than those recovered by denitrification (see Eq. (11.69) and consider OH- + CO2 = HCO-). The ASM 1 model makes it possible to simulate different loadings of municipal activated sludge plants in steady and non-steady state without biological phosphorous removal. It can be used as the basis for a training program for the staff of wastewater treatment plants and for design calculation of the plant and optimization of the processes. After intensive study of the model, the reader of the matrix (see Table 11.4) will see the advantage in using the matrix in combination with a computer program.